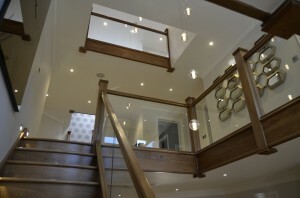 This Project involved AV distribution and multi-room audio system to cover pretty much the whole house. The system was to include a cinema system in a TV room, and also to include mood lighting to a number of rooms, the central hall and landings. A minimalist approach to the TVs was taken, with no visible additional boxes around the TVs other than a Soundbar underneath. We suggested an HDMI distribution matrix, and after some degree of discussion homing in on the customer’s requirements, we ended up with 3 Sky boxes distributed to 9 TVs via a couple of HDMI distribution Matrix switches and splitters etc. This hybrid approach kept the costs within reasonable bounds. We were able to add some wiring to the property, but the majority of the system had to rely on the slightly inadequate existing Cat5 and Coax wiring, and existing lighting wiring. The TV in the lounge was concealed inside a Mirror Frame, with a Soundbar underneath, and the TV in the Kitchen involved adding a lift mechanism to the chandelier above the dining table, so the TV could be seen from the Kitchen area. (see our article on Motorised Control). 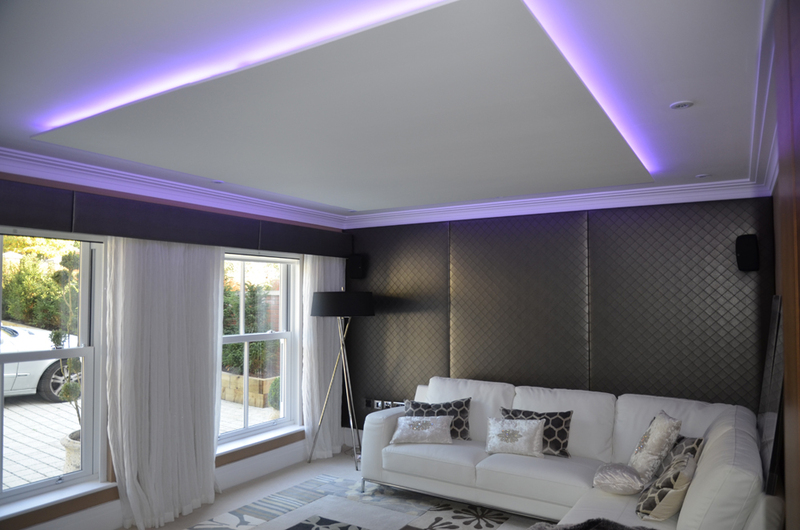 For the TV room / Snug, we added a drop ceiling with a concealed multicolour LED lighting string providing a ceiling/wall wash, and motorised black-out blinds. 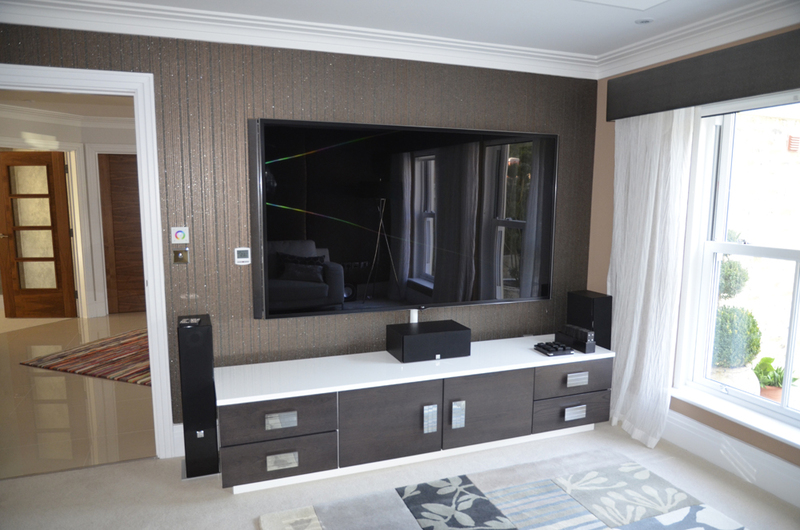 The huge 85″ TV at the front was complemented with some DALI loudspeakers and Anthem amplifier . For the Lounge, a TV was required, however this was only for occasional use and was to be disguised as a Mirror. 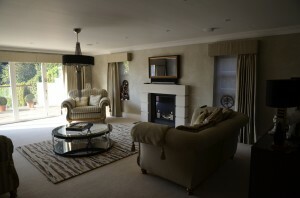 The lighting in the Lounge comprised of downlights and a chandelier, with table lamps and curtains, all controlled as part of a Mood lighting system. 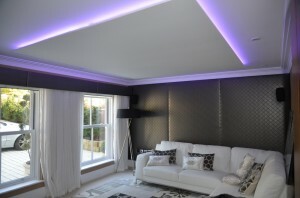 The Rako Controls lighting we suggest was ideal, as it could use the existing wiring without needing to re-wire. We included an interface to the Somfy blinds, so these too could be controlled as part of the lighting system. 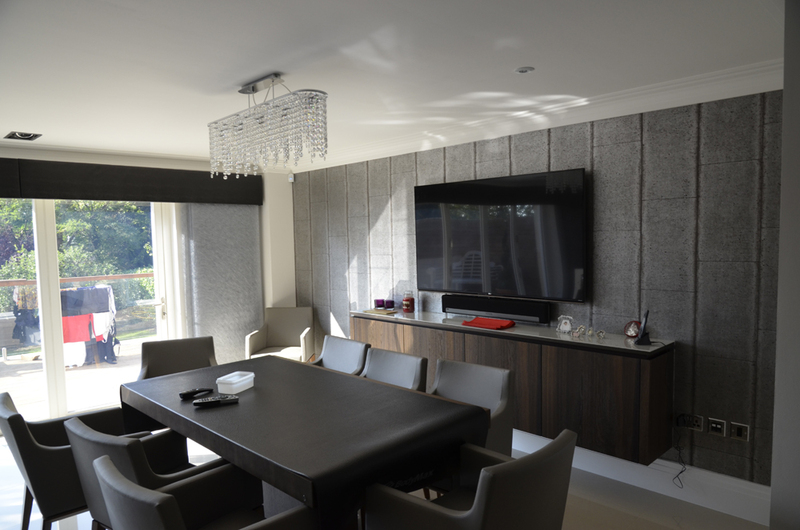 Simple control of the AV system room by room was achieved with the great value Harmony Touch universal remote controls, simplifying access to the Sky Boxes with a simple “Watch Sky Box 2” type of button. Audio was distributed around the house by adding to the existing single Sonos Amplifier, with a series of Soundbars beneath each TV. 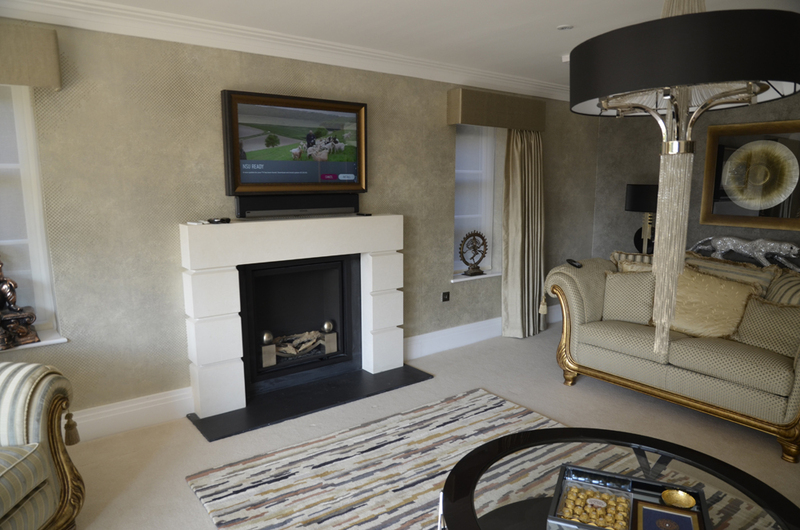 This maximised the quality of the sound for both the TVs and Music, whilst minimizing the amount of additional wiring that was required. Adding a Gigabit Ethernet switch and additional WiFi Access point provided sufficient WiFi coverage for virtually all of the house, meaning that a selection of iPads could be installed to house a wireless Gate entry system, and also provide some semi-fixed stations to control the lights and music.